This is my first experience listening to a Bible audiobook. 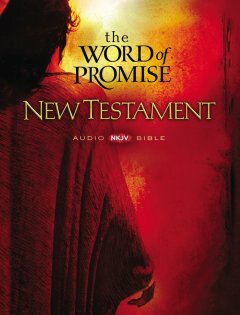 I am so impressed with the quality and production values of the Word of Promise New Testament! The voice actors include well known names like Jim Caviezel, Michael York, Richard Dreyfuss, Marissa Tomei, Stacy Keach, Louis Gossett Jr., John Heard, and more. Their readings are beautifully done, with much emotion. The production also features sound effects (i.e. the sounds of a marketplace, a storm, a door closing) and music. The music by Stefano Mainetti is a subtle and powerful addition to the audiobook. The varied voices, sound effects, and music give this production a more theatrical feel than a standard audiobook. I found myself absorbed in listening as I worked, and often realized that many chapters had gone by. The Bible translation is NKJV (New King James Version). I grew up with the KJV translation. I am not familiar with all the nuances of difference between the NKJV and the KJV, but this Bible translation really read beautifully, with familiar language. I enjoy reading the Bible, but there is something really unique about experiencing the Bible in audio format. I have already recommended this audiobook highly to my mother. I intend to keep this Word of Promise New Testament by my bedside to listen to when I need comfort or encouragement. I truly cannot recommend it highly enough.